This afternoon I took my son, daughter and daughter's friend to the Freestone Recreation Center. There, Tyler and I played racquetball for about 40 minutes. That was a nice workout and we plan to do that more often. Then the three of them played around on the court, while I went upstairs to the indoor track. 12 laps makes a mile, so I did that and then ran on the treadmill for a few minutes. I have pictures, but I'm having trouble downloading them from my treo to the computer. It's 6:45 here and 81 degrees. It just stopped raining, so I have to decide if I want to run some more. So, do you think I'll run? 20 consecutive days of exercise. Hint: It's not in Edmonton and that's not a frozen pond out back. Baseball & Google Earth quiz: In the above photo, you can see the runner almost to first, whom did he hit the ball too? You can click on the photo to enlarge. I ran last night and again this morning. Just a short run before church. I ran 2.09 miles and finished in our park. I felt more tired and I'm assuming that was because I ran last night too. In the park their were some men playing cricket. I don't know anything about cricket, but it was interesting to watch. Might be fun to play sometime. It's Hall of Fame Day in Major League Baseball. To all those Tony Gwynn and Cal Ripken, Jr fans, congratulations. Baseball doesn't have enough men like these two. do you get excited when it rains. So, after dinner I strapped on my garmin and went for a run in the rain. The cloud cover made it impossible to find satellites, so I ended up taking off the garmin, strapping on the old HR monitor and running without my favorite accessory. The rain stopped quickly, but it was still cooler than it has been of late (low 80's). It felt great. I ran for 4.4 miles in a little over 57 minutes. Not a blistering pace, but enjoyable non the less. I ran past restaurant row and boy did that smell good. Arbuelo's Mexican Kitchen, Olive Garden, Red Robin, Baja Fresh, The Elephant Bar, Pampadoro's, PF Chang's and a few other restaurants. I didn't run past the meanest dog in the land. After I was done, I got on Google Earth to map my loop and find out my distance. GE updated the photo of our area and it is awesome. Our home is the one to the left of the pin with the pool and the Honda Pilot in the driveway. It's an amazing photo. You can even see the pool vacuum hose in our neighbors pool. My daughters volleyball team won it all. 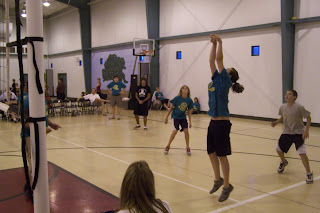 We had to beat Gilbert UMC twice tonight to win. That's my daughter, Emily with both feet off the ground. You can see me, Coach Pat in the background. We came home and celebrated with German Chocolate Cake and then I got on the stationary bike for 1 hour and 14.6 miles. 17 consecutive exercise days and counting. Here's some helpful calculators that runners can use from Marathonguide.com. Listed above is my HR zones. click on it and you'll get a better view. The Volleyball Tournament - My daughters team played in the tournament and won easily in the first round, but was challenged in the second. Playing the best of three, they lost the first and came back to win the next two. On Friday night they'll play Gilbert UMC, a tough team and maybe the most well rounded in the tournament. After the night of volleyball, I got 30 minutes in on the stationary bike for 6.7 miles. This extends my consecutive days of exercise to 16 days. I found it on a new blog, that I love - Half-Fast. I wanted to get up earlier and run at South Mountain Park. Get some hill work done on the 5k course that my next race is going to be on. But, that was not to be. Instead I ran in the neighborhood going down some streets I had not run on in a while. It was 7 am, 82 Fahrenheit and humid. Well, humid for Arizona - 68%. Ran 3.11 miles in 40:56 for a 13:07 pace. The 15th consecutive day of exercise. Got to run in a new commercial development at the end of our street. On the map it looks like a leveled field (actually desert), but now it has a 5 story building and several smaller single stories. There's a Mowi Wowi that is having it's grand opening this weekend and a Firehouse Subs opening soon. Can't wait to see what else. Then I moved on thru the various subdivision and encountered the dog. I didn't hear it. It didn't bark. I was just crossing over the street when I heard a lady yell, "sorry, sorry" or something to that effect. I thought I was about to be hit by a car, but then I saw the dog. Big nasty teeth and it looked pretty fierce. I thought it was a pit bull at first, but now that I think about it I think it was something else. It had a buddy too, but that dog wasn't aggressive. As the dog got to my feet, I turned to him, gave him my meanest look and yelled, "STOP, STOP" , as loud as I could. I could have grabbed him at this point, but he saw I wasn't going anywhere. I was prepared to grab him and drop him with a knee to the gut or a foot to the chest. Luckily, the owner was right on his tail and apprehended the dog before anything happened. I'm sure contact would not have been a good thing for anyone. As she was dragging her dog out of the middle of the street, she kept apologizing. I gave her the mean runner look I gave the dog and started running again. My garmin shows that my HR was elevated at this point. School starts in a couple of weeks and kids will be in the streets then. Hopefully, this dog won't be. I know it's just being itself, but it seems there's a lot of mean dogs around. I counted three this morning. I ended my run with stretches in the driveway and a bowl of cold watermelon as I write this post. I hope you all have a great day and a better run. Maybe I'll get to South Mountain tomorrow. Oh yeah. . . 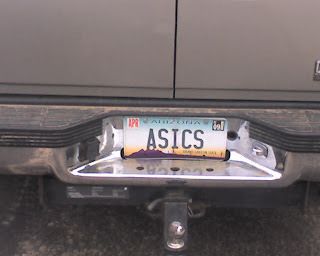 I saw this plate as I was running today. And yes, I had on Asics. First day at the gym. I ran on the treadmill for 40 minutes. No walking, no resting. Solid running. Since, I am not used to treadmills I started out at 3.9, which I found out is a 15+ minute pace. I thought I was flying, guess not. I ran at that pace for about 30 minutes then kicked it up to 4.5, 4.8, 5.0 and 6.0. I liked being able to keep my heart rate down in the 120's and 130's. At 5 and above it got up into the 140's. Then I went to the pool. I made sure it wasn't busy. Didn't need to embarrass myself. I borrowed my daughters goggles and swam freestyle. I did have trouble getting air and continuing. So, I would swim, walk, repeat. Just a little over 11 minutes and that was it. Not because I was tired, I just needed to get going. Quote of the Day: "The first step to getting somewhere, is to decide that you are not going to stay where you are." - John Pierpont Morgan. Blogging Friends: I have many blogs I love to read. Sometimes they are new to running and they blog for a while and then it stops. But, some have blogged for years and when they stop I get worried. So, if you ever take a break from blogging let us know on your blog. Irene, did so when she needed a break and others have as well. If, you've taken a break let us know 'cause I get a little worried. I've told my wife that if anything should happen to me, she's in charge of the blog - at least the final entry. Watched this Robert Redford classic tonight. It was a father's day present, an easy gift for me is any dvd that is baseball related. But, I'll probably start doing any dvd that's running or endurance related too. Trivia Question: Roy Hobbs hit the game winner with a bat named? Since I watched a movie, I taped the end of the Brewers v. Reds game. Watched most of the end while riding the bike. 40 minutes, 9 miles and the game still didn't end. But, my tape did. I had to turn on ESPN to find out that the Reds won in the bottom of the 12th. Sorry, Mike and J-wim. The good news for the Brewers is that Braun kid. He's amazing. Barry Bonds (steroids) must be tickled pink that Michael Vick (dog fights) and Tim Donaghy (betting) are making him look good. Finally, another use for the Garmin. My son is learning to drive so I had the garmin on and it recorded his speed and where he went. I was with him today, but maybe this could be a tool for later. When you like maps, graphs and running a garmin 305 is the ultimate toy. I'm looking at the garmin training center, motion based and sporttrack's various websites to log my information. All three have free websites and motion based has an upgrade for a monthly fee. At first I thought sportTrack was lacking, but once you really look at all their features and click on all their carrots you see they give a lot. The picture above is one view of their software. Of course, motion based has a lot too, but they only keep your last 10 runs available. I'll keep playing with each website and make a decision later. Ran the neighborhood tonight after my daughter's volleyball game. I'm one of the coaches and I was very pleased with our team. We played with only 5 players, one short of what we needed. 3 girls and two boys. And we won. Ate some watermelon and headed home. Oh yeah, the run. 2.4 miles around the neighborhood in about 30 minutes. I tried to stay around an 11 minute pace for the first mile, but my heart rate still climbed over 160. Then I tried to run at a 12 minute pace, but my heart rate still climbed over 160. In this heat, I might have to run 13 minute miles to keep my heart rate down. The fourth race of the summer series is in the books. I woke up to a nice rain. It was cool and a perfect morning for a run. So perfect that it is now 8:30 and I feel like running some more. 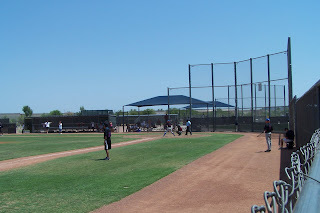 The race was at Kiwanis Park in Tempe. A park I have raced in 2 other times. But, the ARR course is a bit different. Less hills and partially on the canal. These ARR races always draw a crowd and this morning was no exception. Right before the start of the race I found Lisa (Javamom) at the start line and we waited for the race to begin. I told her that I would run with her and help her keep a PR pace. We wanted to shoot for 11 minute miles and at the two mile marker we were at 22:30. The hill from the lake to the canal slowed us down a bit, but we made up for it by doing the last 1/10 of a mile at a 9:47 pace. We did the entire race at an 11:31 pace and Lisa got her PR. I was very happy with the race, talking the entire race (which probably drove Lisa batty) and working up a good sweat. It must have been more humid than normal, because I was drenched at the end. And it wasn't the rain, since that stopped when I pulled into the park. While in line for bagels and watermelon, Lisa found Phil. We all got to chat for a long while and Phil introduced us to Chad (non blogger) and another gentleman (I forget the name, sorry). Hopefully, I'm getting adjusted to the heat and my times will improve. I'm hoping to set a PR in the final summer race at South Mountain in 3 weeks. In order to do that I'll need to go below 31:06. Here's the stats from Garmin. I have a race tomorrow morning, but I did want to sweat a bit tonight. I went to the batting cages and hit for a half hour and then came home and did a one mile easy run. Time 11:38. And he brought me my new Garmin 305. I was going to go the the gym and run on the treadmill since it was so hot today. But, since I got my garmin I decided I could weather the 104 degree temps. With a slight breeze and the sun falling in the western sky I strapped on my garmin and left my ipod at home. I ran west toward Desert Breeze Lake, one loop around the lake and ball fields and then back home for a 3 mile run. Still doing too much walking, but hey. . . it beats sitting at home in front of the tube. Here's a picture, non running related of my wife Amy, me and my son Tyler. My daughter Emily was manning the camera. Notice the sign. 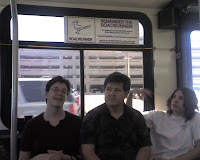 We always park in the airport long term parking called - Roadrunner. How appropriate for a runner, even a runner like me. The Gym: I got a postcard in the mail yesterday offering 6 weeks of membership for $19. So, today I marched on down to Pure Fitness and signed up. I had to go through the sales pitch. I don't think he liked it when I said I wasn't interested in a personal trainer and won't use the weight machines all that much. I just wanted the treadmill when it is hot and the pool to try some swimming. For the past 9 days I've done some kind of exercise. Ran, stationary bike, water jog or softball. It rained last night in the Valley of the Sun. Around this time of year we have the monsoon. Our rainy season. And sometimes it actually rains during a Phoenix rainy season. Which means hot temps and high humidity. This morning at 5:30 am it was 85 fahrenhiet and 59% humidity. Sometimes we get a haboob, like that pictured here. Strong winds whip in from the desert picking up anything that's loose - mostly sand and dumping it in our pools, patios and cars. This morning I got in 4 miles but it took me 60 minutes. I did some walking and I guess it was longer than normal. I worked up a good sweat and burned some calories, so I'll take it. I hope the humidity is low for my next race this Saturday. Quote of the Day: "The greatest discovery of my generation is that a human being can alter his life by altering his attitudes of mind." -William James. Does he have an advantage? Oscar Pistorius is a fast runner. He may qualify for the Olympics, but the IAAF feels he has an unfair advantage. Of course, this advantage is available for any runner who has no legs and yet he's the only double amputee that runs this fast. If he's not allowed to run against able bodied 400 meter runners, then the fastest runners in the world will never know if they're faster than Oscar. If I was an elite, I'd want to know. Today was a rest day. I did 30 minutes on the stationary bike and watched the tape of the Hy-Vee Triathlon from Des Moines, Iowa. Ran last night and again this morning. It was getting late and the sun was racing across the sky. But, I knew that if I wanted to get a run in today, it needed to be this morning. I decided that I wanted to run a mile as fast as I could. I headed over to the junior high track. Jogged a warm up lap and then ran a half mile in 4:30 (9 minute pace). The sun however caught up to me and I then did the last two laps in 6 minutes (12 minute pace). A 10:30 mile. My PB for the mile is 9:30 in cooler times. Headed home, turned on the Reds v. Mets game and hit the stationary bike for 1 hour and 2 minutes. Doesn't look good for the Reds today. I did a little channel surfing and watched the Hy-vee Triatholon in Des Moines, Iowa. I taped it, so I'll watch it all later. Never thought I'd have a tought time deciding on whether to watch baseball or an endurance sport, but I guess that's how my life has changed over the past year. Picking up the family at the airport tonight. I liked the first few days of peace and solitude, but I do miss my wife and kids. I have to go to the grocery store this afternoon, so they'll have something to eat. Quote of the Day: "If you do what you always done, you'll get what you've always gotten." - Anthony Robbins. 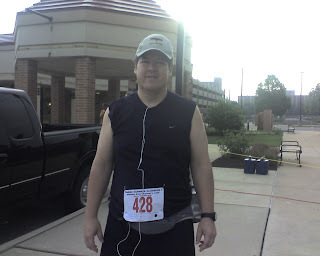 My next 5k is on the 21st of July. It's the 4th race of the summer series for the Arizona Road Racers. ARR's race is at Kiwanis Park, a park I have raced in two other times. However, they added the canal as part of thier course and eliminated several hills near the lake. The runner formerly know as Javamom will be running with me. We plan to stick together, do 11 minute miles and get her a new PR. It'll be fun, so if anyone is planning on running this race and would like to run with us, let me know. I got another pool run in after my road work. 45 minutes of running in place. I got my HR up to 103 average and a high of 115. This was after a 1.72 mile run in 102 degree weather. I ran 1.5 miles straight (which is longer than I have done this summer)and then after walking the next .22 miles realized I was done. I was a bit dizzy and when that happens I call it a nite. Tired legs and exhaustion I can take a walk break, but I don't like dizzy. I read that a pool run is like running with half your weight. If that's what it feels like to run at 115 pounds, I want to lose more. I like pool running. Now I have to set up a TV and VCR on my back porch so I can watch baseball while I run. That's heaven. 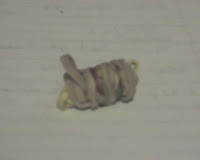 Rubber Band Ball: I started to making a ball out of rubber bands. Each day I run, I add one rubber band to the ball. I have 3-4 bands and it doesn't look much like a ball yet, but some day I expect it to be huge. I'm calling it the Arizona Republic Rubber Band Ball, since they provide me with one rubber band every morning with my newspaper. Amazon.com and Costco have the Garmin 305's for $219.00. And I just learned that you can get a $50 rebate too. That makes it $169. Unbelievable. Someone said that they are clearing them out because of a new model, but I haven't seen anything in print about it. Softball: Last nite we lost our first game in the summer softball tournament. We were short several of our good players and we still kept it close. We lost 9-8. I didn't hit well, but did fine pitching and made several plays in the field. Softball will start again in September and we plan of fielding a coed team and a men's doubleheader team. If you live in the Phoenix area and would like to play, let me know. You thought running was hard? 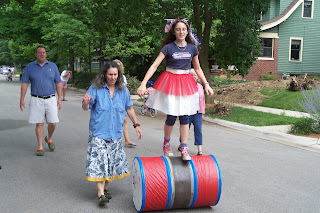 This young lady does this barrel thing every fourth of July. My mother in law's street has a bike parade for the kids every independence day. I wonder if she could do this in a 5k? Sweat and the Biology of Bliss. 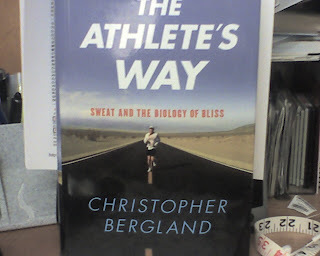 I just started reading this book by ultra runner Christopher Bergland. He says it's all about making exercise a pleasurable habit and I agree. I'm at my best when I'm running for the fun of it, as opposed to running because I need to get the mileage or work on my speed. When I finish, I'll have a complete book review. "I would not talk so much about myself if there were anybody else whom I knew so well" -Henry David Thoreau (I guess he blogged before there was an internet). As far as my running goes. . . I got a run in yesterday and one today. They were both morning runs (6:30 am). I can run at night when it's 95 or in the morning when it's 85. I choose the morning. Neither run was exceptional. 2.19 miles yesterday in 30 minutes. 2.96 miles today in 44 minutes. I'm having a difficult time concentrating. Or maybe it's letting my mind wander. As soon as I get close to a mile, I start to think negatively about my legs being tired or being out of breath. I'm blaming the heat in Arizona or the humidty in Ohio. The bottom line is I need to focus on something positive and keep running. I know that it's the last 20% of the run that makes you stronger. I am once again a member of MyFoodDairy.com. It's a pay website that you can track your calories, workouts and measurements on it. Diet wise I've been on vacation all year. Time to start losing pounds, running longer and having fun. Pool Run: I ran in place in my pool for 45 minutes straight. I had my HRM on and it read 99 average and 110 high. Not sure if pool running is really doing anything for me, but I am sweating a bit now that I'm out of the water. If anyone knows anything about pool running, advice would be appreciated. Website on 5 different water exercises. I'm back and it's hot. I finished the day with a 2.43 mile run in 102 degree weather. Luckily, there was a slight breeze. I, also, got 24 minutes of running in the pool with an average heart rate of 105, peaking at 119. Javamom chronicled her day on her blog. I thought it was interesting, so I did too. My first day back from vacation started at the computer like most days. Phone calls and paperwork. 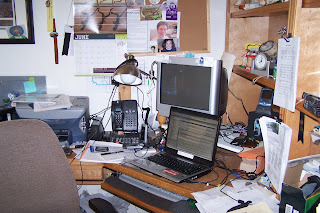 And yes, my day was as hectic as my desk is messy. It will get better the rest of the week. Notice my Runner's World Calendar is still on June. Then it was off to the office. I picked up three commission checks at West USA Realty. I do like picking up checks, however, my wife usually doesn't let me. She's still on vacation so I get to take the checks to the credit union. Which is where I went next. 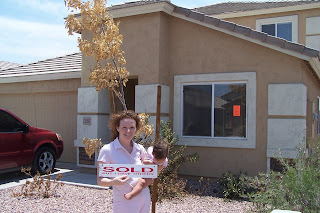 I had to meet with a client and give her the keys to her new home. It was on the west side, about a 60 mile round trip. I got over there early. I went over to the Peoria Sports Complex to kill a little time, hoping that there would be a Rookie level minor league game going on. The only games going on was a high school tournament. They wanted $7 to watch the game. I took a couple pictures and watched a few pitches and then left. I wasn't going to pay to watch HS baseball. Sorry. So I went to lunch. My sister loves Chipotle. I thought I'd give it a second chance. It's good, but I wouldn't say I love it. Here's my lunch. 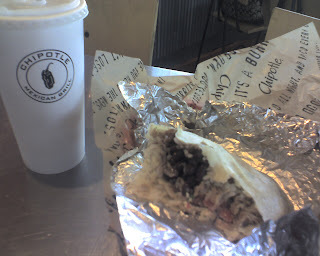 A Carnitas Burrito and soda. Then off to meet my client. Here she is in front of her new home. It's twice as big as the condo I sold her and her husband a few years ago. Then it was back to the east side. 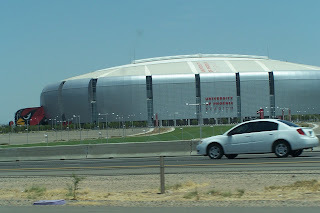 Past the new domed football stadium. 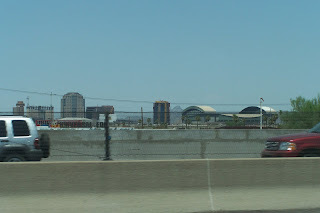 Past downtown and the diamondbacks stadium. For more paperwork and phone calls. 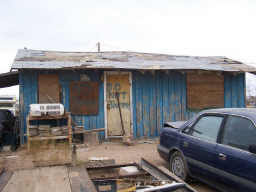 The good news, I got an offer on one of our townhomes for sale. If this offer would have come yesterday, I would have had to pay $1350 to another Realtor to handle the offer. And as you can see, I need the money to do a little work on my home. I usually run flat routes. Here's the elevations of some of my latest runs. 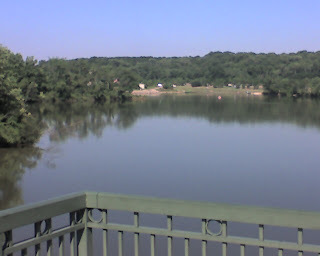 This first one is the Winton Woods Lake run I did in Cincinnati. You can see the elevation is lower than Phoenix and the change in elevation is 166 feet. For a better view you can click on the run name and then on the elevation icon which looks like a rising lightingbolt. This next one is the Happy Hollow route I did in Indiana. It had a change of 222 feet. With over a mile of uphill straight. 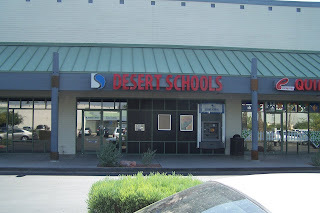 Finally, my Desert Breeze route that is near my home. Over 1100 feet in elevation, but only a 10 foot change. My sister in Columbus, Margie has been walking and losing weight for a few months now. She's looks terrific and I'm very proud of her. I told her about my blog and she decided to blog too. Check out her blog, I think you'll like it. I'm sure she could use some support too. 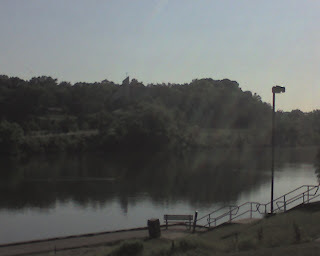 When I was a teenager, my buddies and I would go up to Winton Woods lake and rent a row boat. We didn't fish, but we did like to explore the lake. Today, I ran the trail around the lake. It was a nice asphalt trail. This morning, there was a walking club of about 50 walkers, dozens of people with their dogs, cyclists and a half dozen runners. I did 5 miles in 1 hour and 3 minutes. I had a tought time breathing in the first mile. I think it was the humidity. On Tuesday, I think, I got in another run. a 3.65 mile run around Purdue University. Past Ross-Ade Stadium and the basketball arena. It was a mostly flat run with two small hills in the middle. This was a fun run because I ran it with my sister in law, Raegan. Raegan started running about 2 years ago. She's younger than me, way skinnier than me and faster than me. She was nice, running at my pace and letting me take walk breaks. We got the run in at 41:56, an 11:47 pace. I was very happy with the results. Thanks Raegan. It's around 115 fahrenhiet back in Phoenix, so this is great to getting workouts done here in the midwest. Today, we arrived in Cincinnati. It's raining. I might get a run in on the treadmill tonight and then tomorrow after golf, I'll get a longer run in. 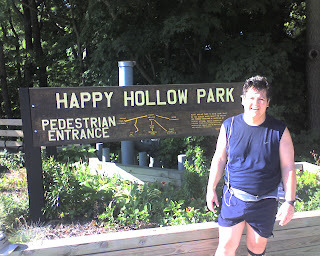 On Monday, I ran the trails at Happy Hollow Park. It's a park in a ravine near my mother in laws home. I could run directly from Cathy's house to the park. Downhill to the far end of the park and then back uphill. This trail is about 1 1/2 miles long and about 1 mile of it is uphill. It's a mixture of dirt, chip bark and asphalt trails. 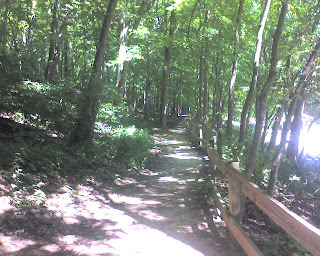 The picture above is a short segment of dirt trail. It took me 10 minutes more (54 minutes and some seconds) to do this four miles. First, my wife said the trail head was at the top of the hill behind the elementary school. I spend some time looking for the trail head there. Finally, I asked another runner and he directed me to another entrance. The elevation change was 222 feet. It went from 550 feet to 700 feet in about a mile. As you can see, it had lots of shade. Very different than running in Arizona. 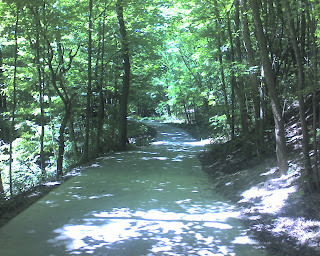 The asphalt trail was very wide and in great condition. Of course, this is vacation. Before the run our family spent time at the swings and slides at the bottom of Happy Hollow Park and then we went to McCords Candies in downtown Lafayette, pictured above. 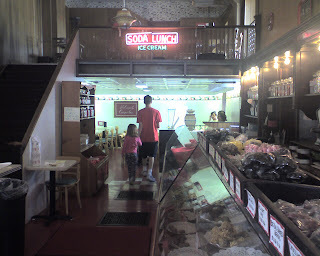 It's a great old tyme ice cream parlor. I had a sundae and considered it carb loading before my run. Much cooler temps here in rural Indiana. Our plane was three hours late getting to Indy and we arrived around 3:30 am. The Hertz rental desk closed before our flight got in, but since we were sooo late, it opened at 4 am for the next day. We got to the hotel for a few hours of shut eye and just 24 hours before the start of the Summer Scamper 4 miler hosted by the Wabash River Road Racers in beautiful West Lafayett, Indiana. The WRRR picked a great course. It was just west of the Purdue University campus. 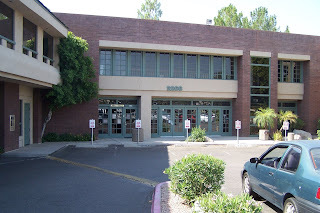 One loop around a shopping strip center and then up McCormick Hill. Not used to hills, it was challenging, but the good news is that it was only one hill and we got to come down it on the way back. 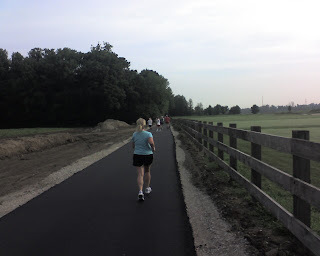 After running on McCormick Road, we got to run on the Cattail trail (pictured above) next to the Purdue Golf course. Lots of fast runners in this race and not many penquins, like myself. Right before the turn around I started running with Candy, a local runner that ran at about my pace. We got to talk about running and life in Indiana and it kept my mind off the running. She doesn't ever stop, so it was good for me. I finished the last 2 1/4 miles without stopping. Only stopped twice to get water in the middle of the race. My hopes were to finish in under a 12 minute pace. If I finished under an 11 minute pace, I would be thrilled. Finish time, 43:43. Just slightly under the 11 minutes I really wanted. I had an entourage for this race too. Jeff and Annie, in laws from Madison, Wisconsin came to watch the race. Jeff ran the Twin Cities Marathon in '99 and plans to run it again in '09. We might make a party of it and all run. I appreciate them coming out to watch. Not a really thrilling thing to do, but they were troopers and were at the start, mid point and finish of the race. Jeff took some pictures and I'll post them when I get 'em. 50 States: This makes the 3rd state that I have run a race in. Arizona, California and now Indiana. I might do a race next saturday in Ohio. We'll see. I ran in Indiana last year, so I'm still at five total states.